Tidy evaluation in R, or tidy eval for short, is a pretty complex topic. But for some specific uses, it's not all that complex. One important task that tidy eval helps handle is both useful and easy: incorporating functions from packages such as dplyr and ggplot2 inside your own custom functions. 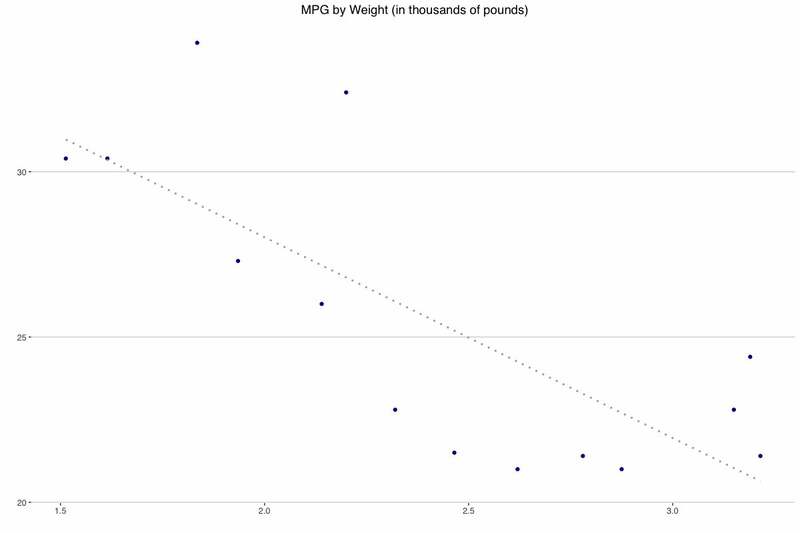 graph_title <- "MPG by Weight (thousands lbs) for higher MPG cars"
Next, I’d like to create a function with this code, so I can easily reuse these customizations to plot other data, not just mtcars. That's where problems arise that tidy eval can solve. To use this function, it’s pretty straightforward to add the graph title, the data frame, and a default minimum value as arguments. But you’ll run into problems with the data frame column names. 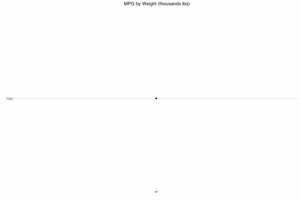 That’s because my function is looking for objects called wt and mpg, and no such standalone objects exist. ggplot and dplyr understand that unquoted arguments aren’t standalone objects, but “regular” R doesn’t. I get a graph, but not the graph I want. That’s because my function now thinks these arguments are character strings, not representations of mtcars data columns. If I try using the full columns for mtcars$wt and mtcars$mpg as arguments, such as in the code below, I get another error. The problem here is that tidyverse functions use tidy evaluation. They don’t evaluate the value of a variable right away. But my regular R function does evaluate the value of an argument right away, because it uses standard evaluation of variables. I somehow need my function to do the same thing as the tidyverse functions do, and use tidy evaluation. I need what I sometimes think of as a metavariable—a special kind of variable that refers to another variable instead of containing one or more values. That’s something the rlang package calls a “quosure.” Hadley Wickham much more accurately describes a quosure as capturing both an R expression and that expression’s environment. One thing that’s special about a quosure, as opposed to a regular variable, is that if you use a quosure in your code, R won’t try to get the value of what’s in there until you tell it to. In conventional R programming—and most programming—I can create a variable x that refers to 3, with simple code such as x <- 3. Any time I want to use the value 3 in my code, I can use actual 3 or, if I’ve assigned 3 to the variable x, I can use x to represent that value. R will immediately evaluated the value of x. If you type x ^ 2 in the console (after assigning 3 to the variable x), you get the value of 3 squared. Using a variable in general makes code more reusable. To access the value of what that quosure contains, you have to tell R when and how to do that. I sometimes think of the quosure having a timing element, so your code doesn’t try to get what’s inside it until you say so. Interactively in the console, you can use quo_get_expr() to see a quosure’s stored value, such as quo_get_expr(x2) . But inside a function you’re writing, you want the quosure’s value and its environment. You access both with what’s called the “bang bang” operator: 2 exclamation marks. Any time you need the full expression that’s stored inside a quosure, just refer to the quosure object with !! in front. One last tip: When you’re writing an R function that needs quosures, make sure to create those quosures before you need those variables in your code. The first two lines of the function create quosures; the next two lines use bang bangs to use the quosures. This is a very simple case. I hope that Lionel Henry and Hadley Wickham, authors of the rlang package, aren’t cringing in horror at this explanation if they’re reading. But it works for me for this basic use case. I hope it works for you, too. There’s a lot more to know about tidy eval, and more operators in the rlang package. You can read more from RStudio at tidyeval.tidyverse.org. Sharon Machlis is Executive Editor, Data & Analytics at IDG, where she works on data analysis and in-house editor tools in addition to writing and editing. Her book Practical R for Mass Communication and Journalism was published in December 2018.